Mark Antony as member of the Second Triumvirate 43-38 B.C. 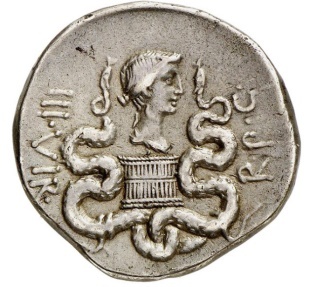 Silver Cistophoric Tetradrachm 11.92gm:Ephesos in Ionia 40 B.C. M ANTONIVS IMP COS DESIG ITER ET TERT, laureate head of Mark Antony right. Draped bust of Octavia right about Cista mystica between 2 snakes. Reference: RPC I, 2201 IIIVIR -. RPC. 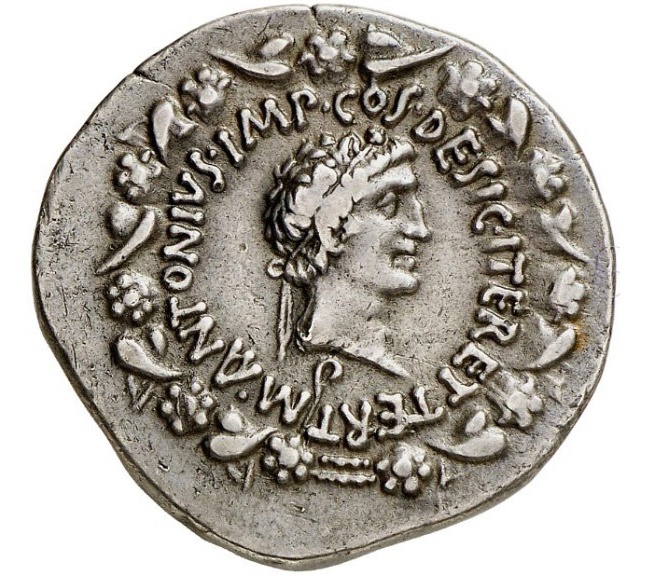 Antony, Octavian, Lepidus. Embossed on the wedding of Mark Antony and Octavia Minor. From the collection of a Munich physician, purchased from the 1960s to the late 1990s.